Nevin A. Seeger has been a practicing attorney since 1979. He is a well-known and respected member of the Colorado bar. He has practiced in many different areas of law over the years, but has decided to focus his practice on the needs of persons who are disabled, civil litigation, business litigation, and those who choose to ride motorcycles. Mr. Seeger has tried many significant cases in the courts and in administrative proceedings, and gives first rate representation to his clients from the initial contact, through trial or appeal if necessary. He considers it to be important to involve his clients in the legal process, to explain it clearly and in terms his clients can understand, and to get his clients ready for their part in the legal process. Mr. Seeger wants to take some of the anxiety out of the process, and to make things easier for his clients during difficult times. Nevin A. Seeger has been A-V rated by Martindale-Hubbell for over twenty years. This means he is rated as a preeminent member of the bar, with highest ethical standards, as judged by bench and bar in surveys. He has offered no fee services to the needy in this community over the years through an active pro bono practice, and has offered his services to several community organizations. General Description of Practice Nevin A. Seeger has owned and managed a private practice, both as an individual and as a partner, since 1982. For three years prior to that he was an enforcement officer for the federal government. 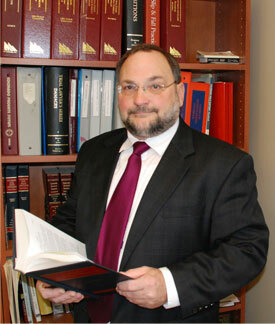 Mr. Seeger has broad experience in the law, including many areas of practice. He now concentrates his practice in disability law, including primarily practice before the Social Security Administration and in the United Sates District Court litigating entitlement to private disability insurance benefits, and civil litigation. In his practice with an emphasis on litigation, Mr. Seeger has significant courtroom experience and first chair trial experience, with primary responsibility for case management through trial. Mr. Seeger has been A-V rated by Martindale-Hubbell for over fifteen years. The very few attorneys who are so rated have been rated as a preeminent member of the bar, with highest ethical standards and professional skills, as judged by bench and bar in random surveys. Mr. Seeger has been instrumental in assisting other law firms to put in place office management and case management systems, including procedures and forms to more efficiently and professionally represent their clients. Mr. Seeger has also had an active pro bono practice. Current practice emphasizes representation of people with disability claims, including claimants before the Social Security Administration and private disability plans under ERISA. Mr. Seeger also has an active litigation practice, including construction defects and mechanic’s liens, business disputes, franchise disputes, motor vehicle accidents, motorcycle collision claims, estate litigation, real estate litigation, and commercial litigation. Mr. Seeger has presented a continuing legal education seminar for other lawyers, Disability Law for the Non-Specialist. In addition to representing many individuals and families, Mr. Seeger has represented numerous businesses, construction companies, banks, insurance companies, and police and firefighter unions. He has substantial courtroom and writing experience, including numerous appeals before the Colorado Court of Appeals, Colorado Supreme Court, Tenth Circuit, and Florida Court of Appeals. U.S. Court of Appeals for 10th Circuit. Sponsor of the Mentor program for the Colorado Bar Association; provided substantial training to younger attorneys to assist them in developing courtroom skills and professionalism. Sponsor in the intern program for the Denver Paralegal Institute; provided substantial training to paralegals to assist them in developing paralegal skills and professionalism. Business Representative, Collaborative Decision Making Committee, Steele Elementary School, Denver, Colorado, self-governing committee, 1998-2000. Columbia College, Aurora, Colorado, and National College, Aurora, Colorado; taught courses in business law and history. Provided legal support for commissioners regarding preservation and use of national interest lands; generated legal opinions used at the highest levels of both federal and Alaska state government for decision-making regarding designation of federal lands within federal land management agencies, and allocation of lands to the State of Alaska and Alaska Native Corporations. Prepared educational seminar for state legislators on the contents of Federal Energy Act, and state legislature’s role under the Act. and Environment, Roads and Transportation, Education, and other committees; prepared background materials for legislators on significant health legislation; drafted and issued press releases. Taught American government and foreign policy classes. Elected to represent precinct at general elections, and to campaign for party candidates.